The new 12 000 square meter urban park, Battery Park has recently launched. Situated at the entrance way of the V&A Waterfront in Cape Town, the development is a nucleus of a larger urban vision for the district. The site includes a park and piazza that effectively conceal a 1206-bay parking facility alongside new pedestrian routes to invigorate activity within the precinct. The site contains the remnants of once of Cape Town’s oldest structures, coastal fortification the Amsterdam Battery. 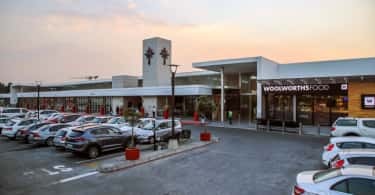 This provided dhk’s architecture and urban design to pay homage to the historic landmark whilst incorporating a parking facility and providing spaces for leisure and recreational facilities. 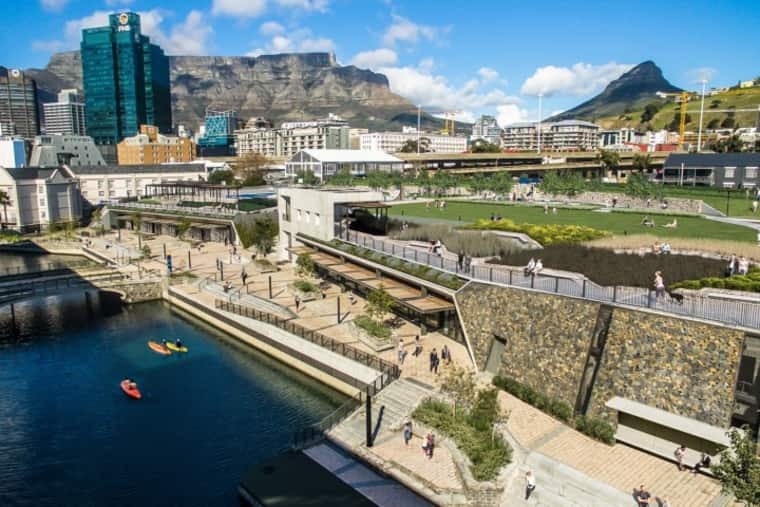 As part of an urban design framework created by dhk for the V&A Waterfront’s previously under utilized Canal District, the development will facilitate the reconnection of the historical city centre and De Waterkant to the V&A Waterfront. The aim was to create a publicly accessible park which lies at a multitude of new pedestrian routes, stitching the new district into the surrounding urban fabric which will help to invigorate the precinct. The Amsterdam Battery was erected by the Dutch along Cape Town’s coastline in 1784 to defend the city from seaborne and land attacks. In the 1800s the building was used to house prisoners; and was later remodeled and strengthened by the British but eventually abandoned. In 1905 the battery was largely demolished to make way for railway connections to the port, leaving behind only a small portion of its rear curved walls. The historical remnants are now perched eight metres above the new canal running through the site at a lower level. During construction of Battery Park archaeological excavations revealed former datums which were used to inform the design. The raised park has been kept at the battery’s original inner courtyard level whilst planted edges above retail units on the piazza represent the estimated natural ground level that fronted the battery. Various architectural and landscaped elements reflect the structure’s original footprint, such as semi-circular curved pathways, concrete additions to the rear ramparts, splayed canal-facing walls and concrete-clad structures – giving visitors an authentic sense of the battery’s former size. An axial visual connection to Cape Town’s Noon Gun on Signal Hill has also been retained, thus preserving the site’s historic sight line. The requirement to respect the original inner courtyard datum and create a lower-level piazza resulted in an elevated park with views across the V&A and CBD but with the challenge of managing the transition between the two levels. Therefore, a large part of Battery Park’s design concept was manifested in breaking the barrier between the park and piazza and bringing them closer to one another. As a result, the park level has been designed to gradually lower towards the canal edge providing a closer connection to the piazza, and in turn, the piazza gradually steps down towards the canal. The vision was to create scale between the two levels and provide visual cues to visitors; offering a glimpse of the park while they meander along the canal edge. This was also achieved by means of various soft and hard landscaping elements such as a grand concrete staircase leading from the piazza to the park, sloping and folding walls, and plants to draw the eye to the park above. “The intention was to facilitate a new hub of activity within the V&amp;A district whilst being respectful to the heritage of the Amsterdam Battery, once a place of exclusion and incarceration, but now a public space designed to support and engage the greater Cape Town community” concluded Director at dhk and lead architect on the project Pierre Swanepoel.